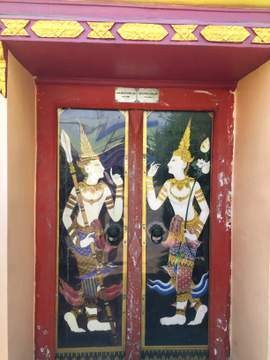 Wat Son is a Bangkok temple in Rat Burana district, with some interesting temple art and architectural features but it’s overlooked because it’s not on the usual tourist circuit and temple tours. 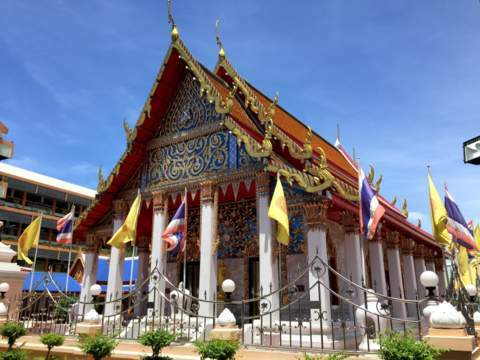 It’s in an area on the southern bank of the Chao Phraya about 8 – 9 km from the city centre, on about 6 rai (9,600 hectares or 2.4 acres) of low-lying land just south of the Chaeng Ron Canal which flows into the Chao Phraya River. 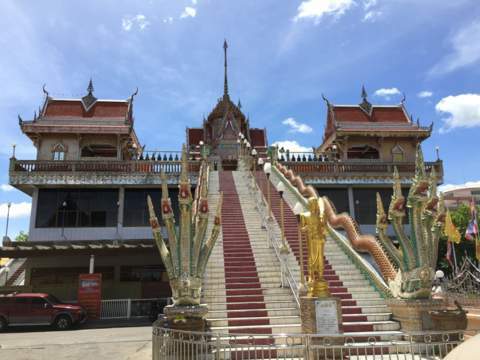 Rat Burana district where the temple is located is south of the wide horse-shoe bend in the Chao Phraya River. This was formerly an agricultural area and several canals are still there. 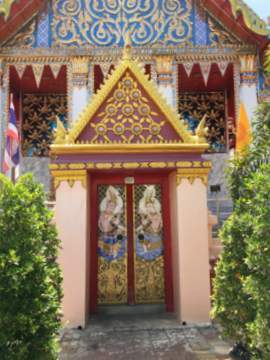 Records estimate that the temple was built around 1857. 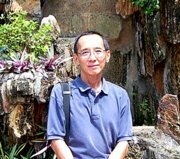 Originally the area had a lot of pine trees (ton son) and that’s how the temple got its name, Wat Ton Son. Over time the name was shortened to Wat Son. Members of the communities in the area donated funds and also contributed manpower to construct the new temple. 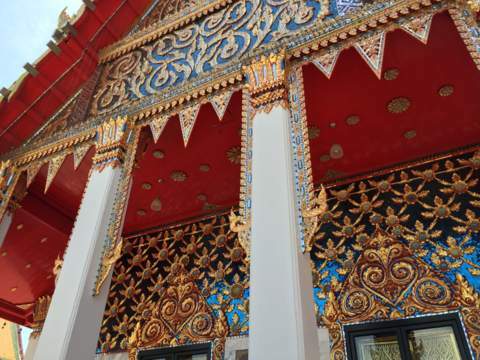 The temple received royal accreditation but again records are unclear exactly when. This was estimated to be no more than 15 years after construction which is 1872. What attracted me to this temple was a striking picture of this building which I spotted in a brochure on Rat Burana district. This image made a lasting impression and I wanted to see the temple for myself. When I got there, the first place I went to was the information board which provided most of the information here. This plaque and door painting are just next to the board. The original ubosot became dilapidated over the years and was finally abandoned in 1915. In 1917 the present structure was built, it’s a 12 x 6 metre building surrounded by a low wall and fence. This was the first building I visited, attracted by the beautiful paintings at the entrance leading to the inner courtyard. 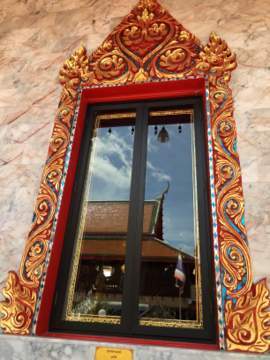 The doors and windows of the ubosot and the ornate decorations on the gables are just as attractive. 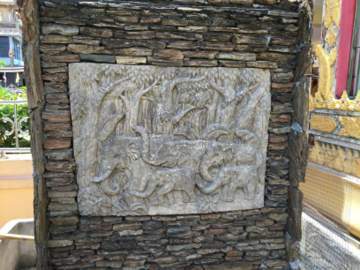 It’s difficult to get a good shot of the ubosot from the front because the building is too close to the wall. However at the rear of the ubosot, the wall is further away and you can get a better view. 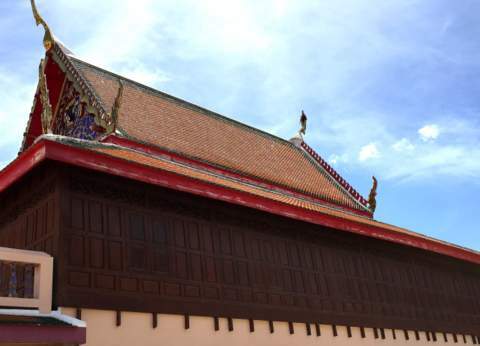 This teak building built in 1918 is the second attraction in Wat Son. 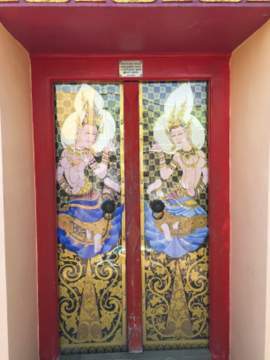 This is the sala kanprian or multi-purpose hall where religious ceremonies for large groups can be held, for example merit making on Vesak Day. Although it’s called the 100-year old teak sala, it’s not quite 100 years old yet at the time of writing. The sala kanprian was restored in 2006. It was originally a completely teak building but I guess the concrete sections for the floor and stairs must have been added during the restoration in 2006. This is the most impressive building in the temple grounds. This was what attracted me to Wat Son in the first place. 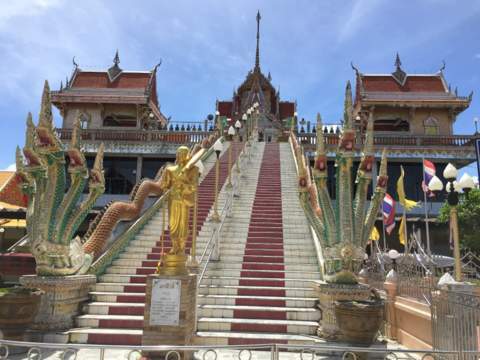 The long flight of 59 steps, with Naga serpents lining the balustrades, provides a grand approach to the structures at the top. As the area is fenced and gate locked, I couldn’t go up to see what it’s like at the top. A sign board at the foot of the steps identifies the structure at the top as a mondop which is a square structure with four pillars and arches topped by a pyramidal roof. From the satellite image, we can see that there are actually four pavilions, one at each corner with the mondop in the centre. 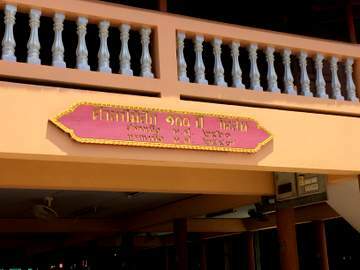 This mondop was built in 1984 with donations from the members of the community living around Wat Son. In the area of education, a religious study centre was established in 1902. 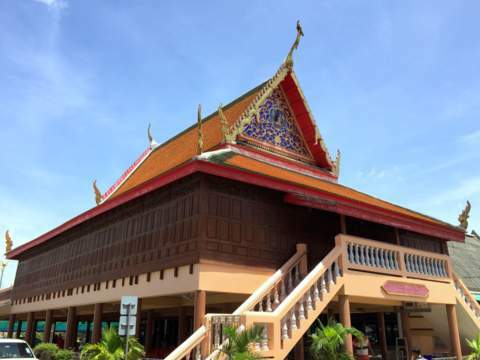 In addition, there’s also a school, the Wat Son Primary School, in the temple grounds. The pine trees that gave the temple its name unfortunately are no longer there, denuded by the urbanization all around the temple. 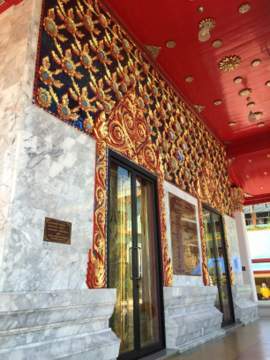 In this temple tour, we had a chance to view three buildings with very different architecture, art and décor. It was a pity the ubosot was locked and I couldn’t get to see what’s inside. Wat Son is one of those temples that’s really off the usual Bangkok temple tour circuit. 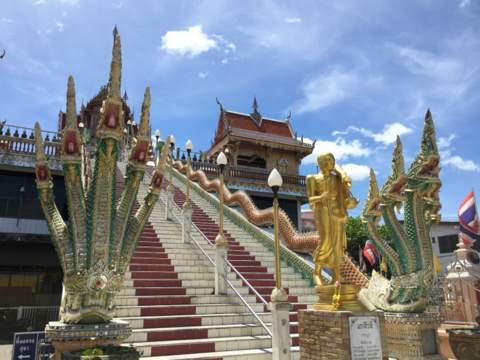 It’s a very local temple and if you really want to get away from the touristy places and have a taste of the local flavour, this is it. Here’s a satellite map of the temple grounds showing the location of the main attractions. The map below shows the location of Wat Son and how to get there. Bus service 37 terminates at Wat Chaeng Ron opposite Soi Rat Burana 44 where the temple is located. The service takes this route; Wong Wian Yai – King Taksin Road – Dao Khanong - Suksawat Road – Rat Phatthana – Rat Burana – Wat Chaeng Ron. 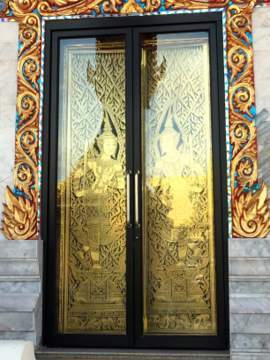 Wat Son can be approached from Suksawat Road via Soi Suksawat 35 or Rat Burana Road via Soi Rat Burana 44. If you are coming from the city centre use Rama III Road and the Rama IX Bridge and exit at Suksawat Road. If you are coming from the west bank of the Chao Phraya, it’s easier to use Rat Burana Road.